Consistency has been the key to Burnley's success, and boss Sean Dyche hopes that will continue against derby rivals Blackburn Rovers. Dyche has only lost 10 of his last 83 Championship games as Burnley boss, winning 46. Two years, no side lost fewer games than the Clarets, on their way to promotion, and they hold that honour again this season as they look to bounce back to the Premier League. Dyche is unbeaten in five meetings with Blackburn since taking over the hot seat at Turf Moor, and, as Burnley look to make it six, extending their current league run of 11 games without defeat in the process, he said: “It’s fair to say our form is deep. We go back a long way, so I want that to continue. “One of the key things for me is to continue that consistent form. “One thing we’re renowned for is the power of the group physically. 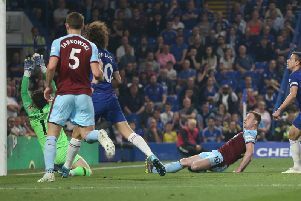 Dyche has remodelled his side after the summer departures of Danny Ings, Kieran Trippier and Jason Shackell, but the team has gelled and maintained a consistency in results: "To get back up there is a challenge in itself because we’ve seen teams go into free fall. “We lost key players, we think we’ve brought good players in. We’ve had to remodel it slightly. People don’t always see it but we have. We’ve remodelled the training and the thinking for the team because you get different people and players in - it’s knowing what the players need and what they need to gel together. “The one message I’ve been absolutely clear on all the way through is that the team is getting strong and moulding. “I’ve said that all the way through - wins and losses - and I believe it. “I think there have been real signs that it has come together more than at the beginning of the season, and from performances not just results. “We’ve earned the right to be there, but it owes you nothing. We have to continue to earn the right."